These are the cookies you take as your contribution to a get together, because they never fail to please. I’ve made several times since first making them a couple years ago and honestly can’t believe I haven’t shared them yet. The likely culprit is there aren’t usually any left for picture taking! These generate requests from friends (Hi, Dan! ), cause awkward comments when brought to other people’s homes (“these are the best thing here!” – it’s okay…that whole day was awkward), and basically, you should make them immediately. Preheat the oven to 350 degrees F. In a stand mixer or using a hand mixer, beat together peanut butter, sugar and eggs until well combined. Divide dough evenly between 24 wells of a mini-muffin pan. Make an indentation in the center of each dough ball. Bake for 13-15 minutes, until almost done. Remove from the oven and press a peanut butter cup into the center of each cookie until the peanut butter cup is flush with the top of the dough. Top each cookie with 3-4 mini marshmallows. Return the pan to the oven and bake another 2-3 minutes, until marshmallows have puffed up. Transfer pan to a wire cooling rack and allow the cookies to cool completely in the pan before removing them. They will fall apart if you try to remove them while still warm. Once the cookies are completely cooled, transfer them to a wire rack over a sheet of wax paper or aluminum foil. Place the chopped chocolate in a small bowl. Bring the cream, sugar and water to a boil, then pour the liquid over the chocolate and let sit for 30 seconds. Gently whisk the mixture together until smooth. Leave ganache to sit until it thickens to your desired consistency, then drizzle over the tops of the cookies. Sprinkle with mini M&Ms before it hardens. These look so good! I will have to try them. These look so cute! 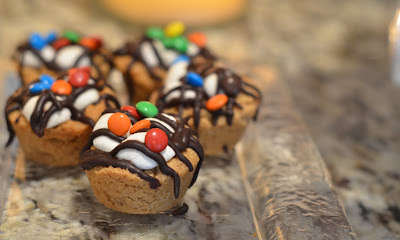 Love making cookie cups and never thought to put the cream and M & M’s inside them!